David Wigton and Ed Price stand beneath the unique installation at Christ the Redeemer Roman Catholic Church, Lake Orion, Michigan. 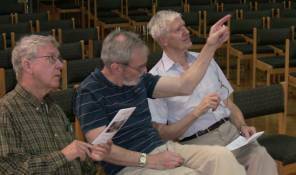 David Wigton points out salient features of the installation to Ed Price (l) and Jim Wilkes. 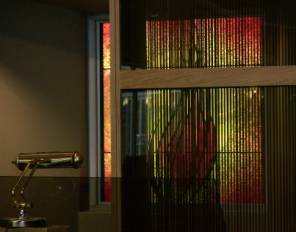 The see-through tracker run provides a good view of the stained-glass window behind. 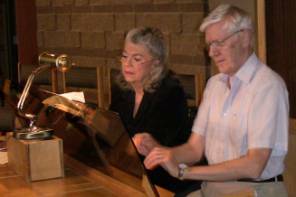 The dynamic duo (aka MaryAnn Balduf and Jim Wilkes) prepare to play a stirring hymn. 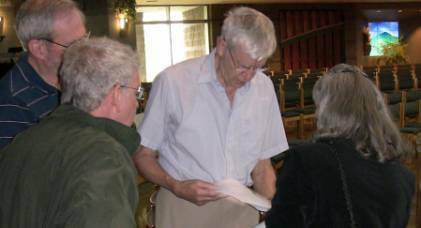 The May 2010 meeting of the Michigan Chapter of the Organ Historical Society convened at 9:30 a.m in the sanctuary of Christ the Redeemer Roman Catholic Church, Lake Orion, Michigan. 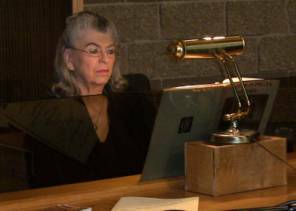 Present on this rainy morning were Carl Balduf, MaryAnn Balduf, Ed Price, Jim Wilkes and host David Wigton of Wigton Pipe Organs, Inc. With so few members present, the formal Chapter meeting was dispensed-with. 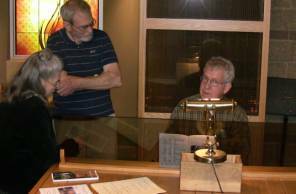 David Wigton provided the group with copies of the dedicatory recital bulletin and provided an oral overview of the instrument, a portion of which can be seen here. 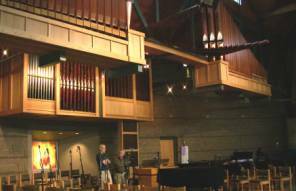 The organ has gone through several iterations, beginning life as a Gabriel Kney (1970s one manual), then as a Petty-Madden 1980s two-Manual rebuild, subsequently enlarged and rebuilt by David Wigton, supplementing the mechanical action with an electro pneumatic pedal. The stop list and samples of the organ's sound can be heard by clicking here. Following an open console opportunity, members of the group adjourned to the Sagebrush Cantina for an enjoyable lunch of Mexican food. 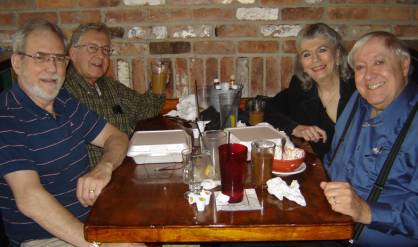 When three or four are gathered together, the food is always great at the Sagebrush Cantina. Left to right: David Wigton, Ed Price, MaryAnn Balduf and Carl Balduf. Jim Wilkes, center, shares travel information with the group, about the best way home from the far northern suburb called Lake Orion. 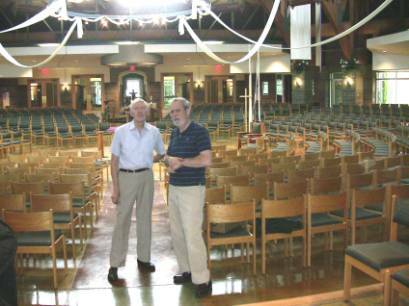 Jim Wilks and Dave Wigton stand amidst the "Church-in-the-Round" setting of Christ the Redeemer Roman Catholic Church.